Reinforcement of the capacities of JPIC animators, a session in Benin | M.Afr. 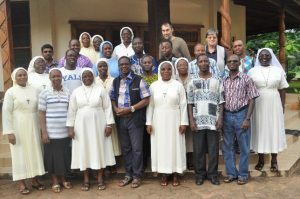 From 16th to 29th July 2017, a JPIC workshop organized by major superiors in Rome was held at the International novitiate of the Society of the African Missions (SMA) in Calavi, Benin. Twenty-three participants from different countries of mission took part in the workshop. Among the participants there were five Missionaries of Africa: 2 came from Mali, one from Burkina Faso, one from Togo and one from Ghana. The workshop has its theme: Reinforcement of the capacities of Justice, Peace and Integrity of Creation’s animators. The aim was to share experience and acquire more knowledge and tools to help JPIC animators become more efficient in their mission. The workshop started with orientation and introduction of participants. It was clear, after introduction that all the participants were conscious of the issues pertaining to JPIC. The participation in the discussion became active by the fact that everyone was interested in the topics. 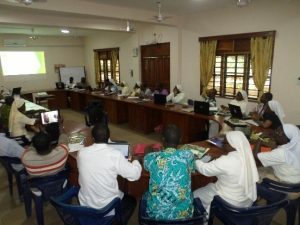 The social teaching of the Church: the facilitator led the participants understand that the Social teaching of the Church is a profession of faith in God and in Man; has its foundation in Jesus and the love of God for humanity. Quoting John 10, 10 “I came that they may have life, and have it abundantly”, he explained the concept of integral development which we find in many documents of the church. Integral development takes into consideration all the aspects of life. It is Eucharist (washing of feet), to leave one’s ego to offer what is universal (hunger and thirst for Justice, peace and love). Africae Munus, Evangelii, Gaudium and Laudato SI’ were among the documents presented and analyzed in their content. Conflict resolution: participants were introduced to the method to resolve conflicts. on economic issues related to Africa on both continents. The main themes of AEFJN are: Access to quality medicines, climate change, Trade and Economic Partnership Agreements, Exploitation of Raw Materials and Corporate Justice, Small Arms Control. The network was presented to encourage the JPIC animators to see at the possibility of forming active groups (antennae) in countries of mission so that those groups can share with the network information and issues related to Justice Peace, and Integrity of Creation. 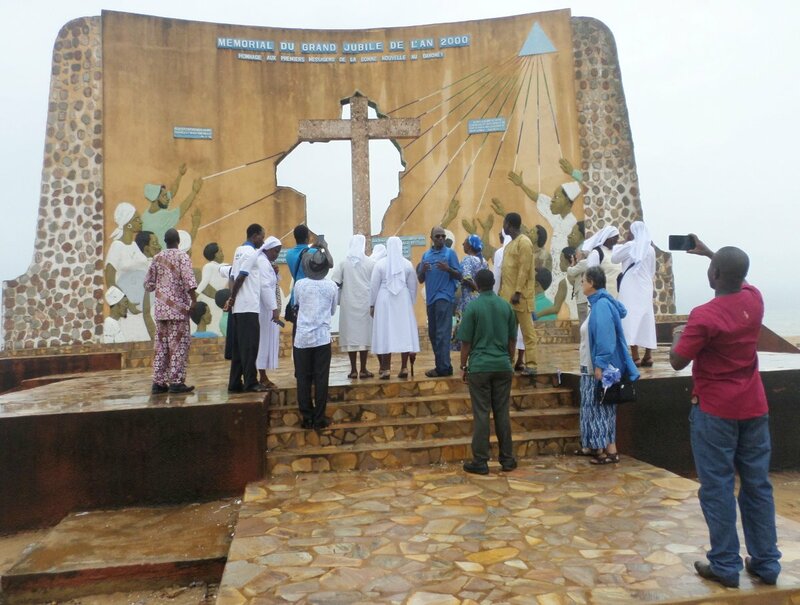 Other communications were on Human Rights and Politics, Genetically modified organism, land grabbing, and visits to Songhai Centre and Ouidah a slave camp. The workshop was for me a time of learning and listening to the various experiences of the…. The workshop reminded the participants of the role of the missionary and other people of good will in the new evangelization: to become more and more conscious of the signs of the time. We live in the world that is challenging us in our mission. There is a need to be attentive to what is happening in our communities at large. The realization of what is happening will lead the JPIC animator to take concrete actions, not only publishing articles. As missionaries, we are called today to become more passionate witnesses of Christ. We have become another Jesus and we must act as Jesus acted. The question would be: how would Jesus have acted in this situation? A Justice, Peace and Integrity of creation’s animator is to work for the transformation of the society in which he or she is living in. He is a man or woman of vision, determined to make to Kingdom of God be manifest in the world. I was personally impressed by the testimonies of some people who came to share with us their experiences of JPIC. They shared with us what they are doing and not what they think JPIC is. The workshop was an interpellation for me. 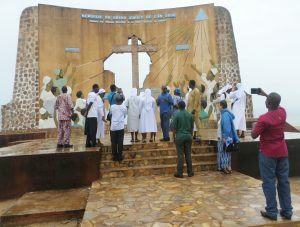 The testimonies, the visits made to some sites in Cotonou, the topics presented and discussed by people engaged in JPIC have become source of enrichment. Listening to men and women engaged in defending the rights of marginalized be respected, men and women engaged in fighting against land grabbing and many other actions…shows that JPIC concerns everyone. The field is large and each one can do something wherever he finds himself. Our milieu of pastoral is the best places for JPIC. Daily small actions can bring changes in our milieu, and the same time can impact those around us. Group photo with the session main moderator, Father François de Paul HOUNGUE (front right) and M. Gino Brunswijck of the AEFJN secretariate in Brussels (at the back). The 25 promotors of JPIC following one of the conferences. 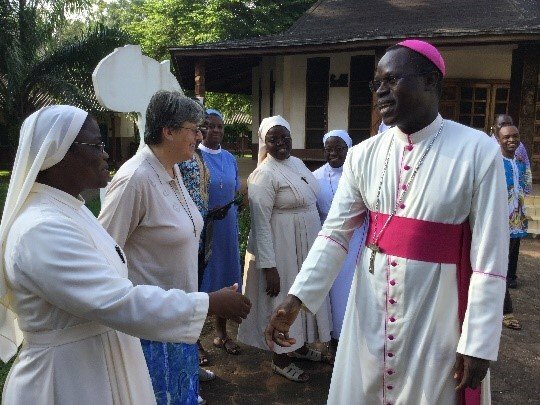 Visit of His Lordship Aristide Gonsallo, Bishop of Porto-Novo. Previous PostPrevious Gerhard Knühl, R.I.P. Next PostNext Yvon St-Jean, R.I.P.